The Korat is one of the oldest breeds of cat in the world and is known in its native Thailand as "Si-Sawat" - the sacred cat and overseer of good fortune. The Korat's silver-tipped coat is steeped in legend because it signifies wealth to the tradesman and the merchant, rain clouds to the farmer and a happy marriage and home to the bride. In Thailand it was customary to give a pair of Korats to a bride on her wedding day. Outside of Asia, this breed first became popular in the US during the early 1950s before taking off in the UK in the 70s. It still remains a firm favourite on both sides of the Atlantic even today. This animal sports a beautiful blue coat, while its large, prominent and luminous green or green-gold eyes are brilliant, alert and very expressive. It is an extremely intelligent animal and is easily trained to fetch a toy or even to go for a walk on a lead. However, the Korat is strong willed enough to let you know what it does and doesn't like - particularly when you are a bit slow to get the message! 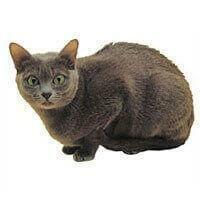 The Korat is a beautiful animal with a gentle, intelligent nature that allows it to bond closely with its owner/s. But while it is a breed that suits most homes, potential owners should be aware that it does like its personal space from time to time and should be provided with a quiet place that allows it to 'get away from it all'.